1 Two force vectors P1 and P2 acting on a body pull in a certain direction. The resultant R is a force with the same results as P1 and P2 combined, pulling in the same general direction. 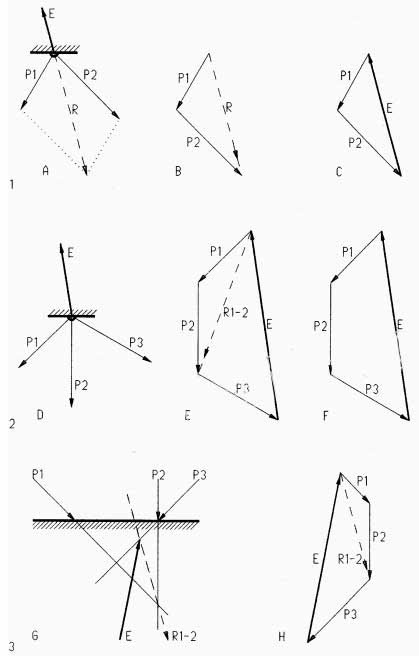 The resultant is found by drawing a force parallelogram [A] or a force triangle [B]. Lines in the vector triangle must be parallel to corresponding lines in the vector plan [A]. The line of action of the resultant is at the intersection of P1 / P2 in the vector plan [A]. Since most structures must be at rest it is more useful to find the equilibriant E that puts a set of forces in equilibrium [C]. The equilibriant is equal in magnitude but opposite in direction to the resultant. The equilibriant closes a force triangle with all vectors connected head-to-tail. The line of action of the equilibriant is also at the intersection of P1/P2 in the vector plan [A]. The equilibriant closes a force polygon with all forces connected head-to-tail, and puts them in equilibrium in the force plan. 3 The equilibriant of forces without a common cross-point [G] is found in stages: First the interim resultant R1-2 of P1 and P2 is found [H] and located at the intersection of P1/P2 in the vector plan [G]. P3 is then combined with R1-2 to find the equilibriant for all three forces, located at the intersection of R1-2 with P3 in the vector plan. The process is repeated for any number of forces.